There are different definitions of what constitutes a natural disaster. Flooding caused by dam failure is sometimes considered a natural disaster and sometimes an engineering failure, depending on what caused the dam to fail. Poor design and inadequate maintenance, such as was the case in the failure of the St. Francis Dam near Los Angeles, and the Johnstown Flood in Pennsylvania, were man-made causes of disaster, which the whims of nature exploited to cause great loss of life in both instances. Calling them natural disasters removes the responsibility from the human failings. Fires started accidentally by humans have led to what became known as natural disasters as well. So have fires started deliberately. Some of the worst forest fires in American history are called natural disasters because of their disastrous effect on nature, but were started by actions of humans. Fires deliberately set to burn undergrowth and the waste left behind by logging operations caused numerous catastrophic forest fires when high winds and dry conditions combined to drive them out of control. But their outbreak was nonetheless caused by the miscalculations of humans, however well intended. 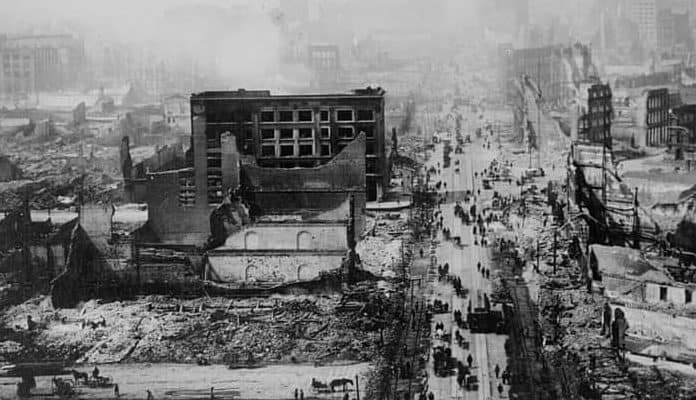 The following is a list of disasters which were the result of nature, though in many cases the actions of those in nature’s path (and sometimes the inaction) caused additional human suffering and casualties. The number of deaths in many are estimates, as are the financial losses, adjusted to reflect the value in current dollars. Here are, based on the number of estimated deaths, the worst natural disasters in the history of the United States. The Great White Hurricane was a blizzard of immense proportions which occurred in March over a period of three days. The storm buried the East Coast of the United States from Chesapeake Bay to Maine, and on into Canada. The railroads ceased operations along most of the northeast corridor, where snowfalls ranged from ten inches to as much as 58 inches, driven by winds which exceeded 45 miles per hour. Some snowdrifts grew as much as fifty feet in height, while temperatures dropped rapidly from the unseasonably warm levels which preceded the storm. Officially classified as a northeaster by the National Weather Service the storm pummeled the east coast from March 12 through March 14. On the 13th the temperature in New York City was recorded as being nine degrees for the high for the day, the coldest March day ever recorded there. Houses were buried in drifts which rose three and sometimes four stories above their roofs, trapping their occupants inside and choking chimneys. Snowdrifts blocked the railroads throughout the State of New York and all of New England, in some cases for more than a week. The storm wrecked or drove ashore more than 200 ships along the coast. Fires broke out in houses where firefighters were unable to reach them, and the loss of property was extensive across the region. More than 400 deaths were estimated to have been caused directly by the storm and the ensuing cold. The transportation disruption led to the proposal of a subway system in Boston, and to New York City moving its telegraph lines underground. Property damage was near $700 million in 2018 dollars, and when the storm melted it caused severe flooding in low lying areas throughout the northeast.